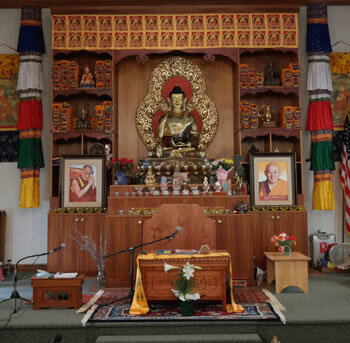 Our community center is dedicated to sharing and sustaining Buddhist teachings and practices, through the unbroken lineage of Drikung Kagyu teachers and visiting teachers from other lineages as well. Our doors are open to all who seek a deeper, truer, more significant experience of life from the general public to Buddhist practitioners of all levels. In keeping with the bodhisattva’s vow to alleviate the suffering of all sentient beings, our mission is to be a source of spiritual refuge, respite and wellness to all who choose to come through our doors. For those who seek guidance on the Buddhist path, we will provide it. For those with a secular interest in meditation and wellness, we will share our knowledge. For those who want to alleviate suffering, we will offer assistance based upon our experience and practice of teachings, including the Four Noble Truths and the laws of cause and effect or karma. In addition, we want to be a trusted neighbor and valued community resource.